Running in Santa Barbara, California. 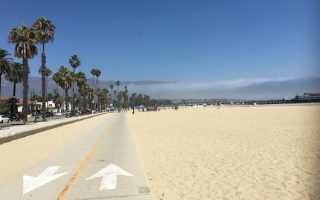 Best routes and places to run in Santa Barbara. 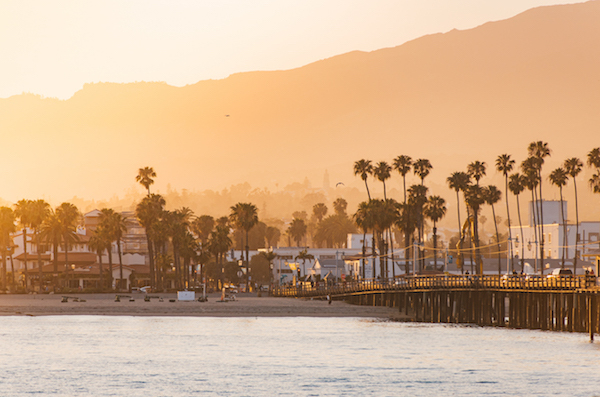 Santa Barbara has all the reasons we love California: mountains, beaches, vineyards, a cultured urban center with a strong running community… and great weather. This coastal city just 2 hours north of Los Angeles (reachable by train! ), also known as the “American Riviera,” offers spectacular scenery. 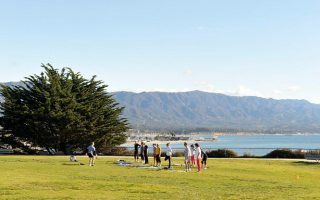 Our guide to running in Santa Barbara includes beach runs, bike paths, central routes through downtown and the UC Santa Barbara campus, and hilly roads through farm fields and vineyards. 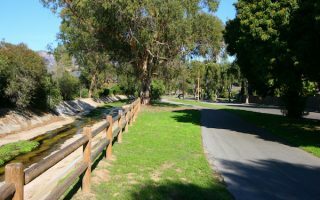 Running highlights include extensive paths along the waterfront from Shoreline Park to East Beach, ocean/beach-centric routes to the north around the UC Santa Barbara Campus and the Goleta area, as well as to the south in Carpinteria. For hill lovers, there are great trail running options in Gould Park, Rattlesnake Canyon, and Romero Canyon. For great homes, run in the windy, hilly streets of the Hope Ranch neighborhood. Note that although the waterfront area is flat, it’s very hilly just east of the city. With an excellent, all-electric bus fleet, Santa Barbara is an easy city to navigate car-free (see santabarbaracarfree.com), though trail runners should know that some trailheads are significantly outside the city and are not accessible by public transportation. 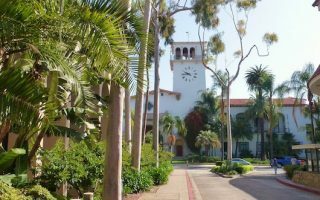 Otherwise, stick close to town and enjoy access to Santa Barbara’s historic sites, shopping centers, wineries, and of course — fish tacos. A pleasant 'runseeing' tour of historic downtown Santa Barbara. We've mapped 2.5 miles from the Mission to the Waterfront, using State St. as an anchor, as well as a map of some of Santa Barbara's historic sites and buildings. The signature Santa Barbara run is between Shoreline Park and East Beach, featuring beaches, marina, piers, parks, palm-lined boulevards, mountain views, and more! The total distance is nearly 5 miles one-way, all on paths. A pleasant, shaded run in one of Santa Barbara's toniest neighborhoods. Lovely homes and beautifully landscaped streets. 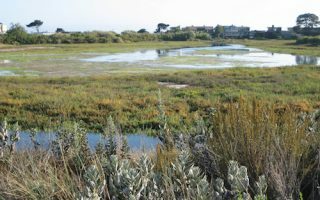 It's about 5 miles from Highway 101 to the shore along Las Palmas Dr. and Marine Dr.
Enjoyable trail through marshlands with a a bridge crossing and a fun little stone labyrinth. 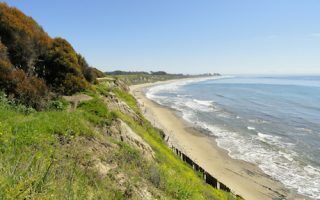 Can combine with a jaunt down to Sandy Point, and/or the trails of Carpinteria Nature Bluffs Preserve, which has 1 mile of trails overlooking the ocean. 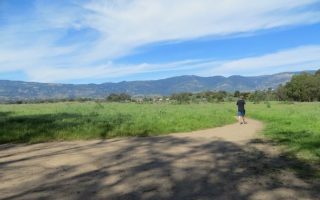 Gould Park is 7 miles north of Santa Barbara and has some great trails for running. We've mapped out a rewarding 2 mile run along a paved path to a the Hot Spring, and a more challenging 2 mile Cold Spring Trail Loop. 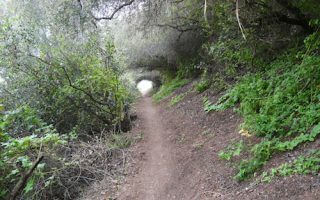 A challenging trail run into Rattlesnake Canyon Park. 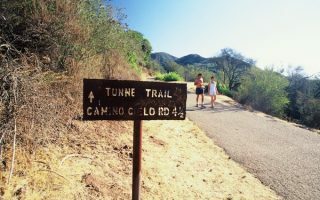 We've mapped a 6-mile loop that twists and turns, offering a good introduction to the Santa Ynez Mountains. Enjoy the Botanical Gardens as part of the run. Lush groves of oaks and sycamores, valley views, and a series of climbs and drops in the mountains above the Summerland neighborhood. The trails can be spliced together for a killer 9+ mile run, but we’ve mapped a more manageable 5.5 mile loop. If you were choose a city with the best weather for running, Santa Barbara would be on the list. Winters are mild, with average highs in the 60s (18C) and cool nights. You’ll need a layer for night or early morning runs. Summers are warm but not hot, with average high temps around 75F (24C), and nights that cool down do around 60 (16C). It’s not particularly humid. 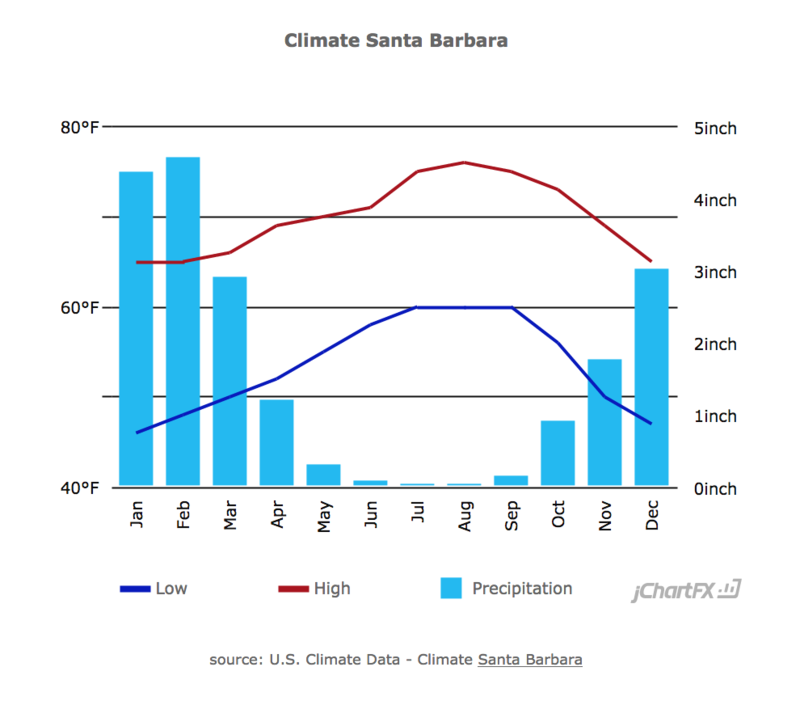 Lioke many California coastal cities, rain is nearly nonexistent from May through October. There can be plentiful rain in the winter months, but there is quite a bit of variation by season. Not also that temperatures can be warmer in the canyons, as you’re away from the coast. 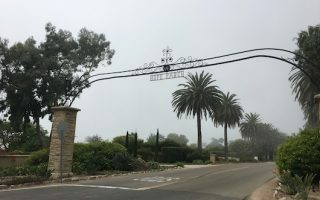 One additional weather factor in Santa Barbara is fog. There can be foggy days, where it takes awhile to burn off. 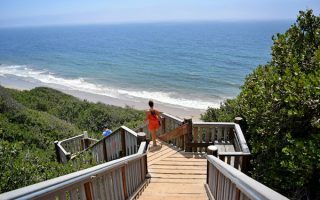 A great resource for where to stay in Santa Barbara is visitsantabarbaraca.com. There’s a good selection of places to stay in Santa Barbara, from business type hotels and boutique spots to inns and B&Bs. For easy access to the best running, try to stay inside the highway (Rt. 1/101), which will get you close to the Harbor and great coastal running routes. The downtown area is quite large. If you’re staying mid-downtown, it’s 1-2 miles down to the water for running. There is decent running downtown, with wide streets and and wide sidewalks, laid out in a grid pattern and so easy to navigate. Santa Barbara Running Company. The major indy running store in Santa Barbara. Family owned and operated. Two locations– one downtown, and the other in Galeta. Group runs: Thursday 6pm from the Anacapa St. store. Lorna Jane Santa Barbara. Downtown. Great store, focused on active lifestyle clothing for women. Santa Barbara Running Company has group runs from their downtown store Thursdays 6pm. 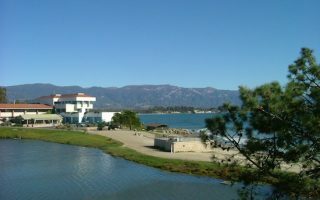 Santa Barbara Running and Racing has extensive training, coaching, and group runs. Great running calendar, maintained by the Santa Barbara Athletic Association. Nite Moves. Famous community event, Summer Sunset series, Wednesdays 6:30 pm with festivities afterward. Run, walk, swim. 5k, or an ‘aqualthon’ series combining running and swimming. Pier to Peak. The “world’s toughest half marathon”, takes you from the famous Santa Barbara Friendship Dolphins Fountain at the edge of Stearns Wharf, past the “Queen of the Missions” and on up an elevation of 3996 feet to the Majestic views at La Cumbre Peak. Thanksgiving Four Miler. Has been going for 21 years. In Goleta area.